Why a Bicycle- and Pedestrian-Friendly Community? Tough economic times demand smart choices, and the West Windsor Bicycle and Pedestrian Alliance believes that biking and walking facilities save everyone money by cutting congestion and reducing the need for wider roads, more parking and courtesy busing. Walking to school is good for kids, and a more liveable community supports property values. See our recent presentation to West Windsor Council, which also debunks some common myths, such as only motorists pay for roads and that adding traffic lanes solves congestion. Read more about how walkability improves property values and how West Windsor is one of the first governments in New Jersey to adopt a “complete streets” policy that accomodates pedestrians and bicyclists as well as motorists. This year’s ride is set for 2 p.m. Saturday Oct. 2 (rain date Oct. 3). The ride is an easy six miles (round trip) from Chamberlin Park (Slayback Drive and Woodmere Way, off South Mill Road) to Mercer County Park (east entrance, on Edinburg Road). It is free, but helmets are required and will be available for purchase at the start of the ride. Drinks and light refreshments will be offered at Mercer County Park. Like last year, we will have some prizes for participants. Bike lanes exist for almost the entire route. There are gaps in the sidewalks along the route and the roads will NOT be closed to traffic. Participants must be comfortable riding on the road and must follow the rules of the road. Children under 14 must be accompanied by an adult. More information (and the waiver form) is on wwbpa.org. The WWBPA is organizing a series of 30-minute events at busy intersections to educate both motorists and pedestrians about the new law that requires motorists to stop and stay stopped while a pedestrian is in the crosswalk. We’ve already held two, at Sherbrooke Drive and Route 571 on Sept. 23 and at Scott Avenue and Wallace Road on Sept. 25. Three more are planned: at West Windsor-Plainsboro High School South, near MarketFair and at Cranbury/Wallace Roads and Route 571. Join us to show your support (we’ll give you a sign to wave!) or give us a thumbs-up. West Windsor police also are increasing patrols to enforce the law, which requires motorists to stay stopped until a pedestrian has crossed the street, not just the lane the car is in. 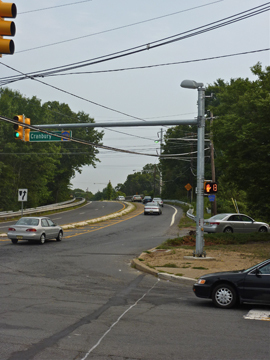 Infrastructure Update New Jersey has upgraded the intersection of Cranbury/Wallace Roads and Route 571 with pedestrian-activated crosswalk signals that show the time remaining to cross. Still to come are the missing crosswalks. This improvement, coordinated with West Windsor Township and Mercer County, stems from a West Windsor Walk held by the WWBPA in October 2007. West Windsor Council has requested that Mercer County create a bike route along Washington Road from the D&R Canal to the Princeton Junction train station. Already, the repaved Washington Road from Route 1 to Faculty Road has wider, more bicycle-friendly shoulders. A decision on when to add bike-lane signs hasn’t been reached.The repaved portion of Clarksville Road also has more bicycle-friendly shoulders. The WWBPA thanks Mercer County, which maintains both roads. The new Meadow Road includes a sidewalk on one side and bike lanes on both sides of the road. However, it remains difficult for pedestrians to reach Lowe’s/Trader Joe’s and for residents in the Windsor Woods apartment complex to access the sidewalk and eventually the new Duck Run Park. Watch our video of the route. The WWBPA is urging West Windsor to better comply with the 20-year-old Americans with Disabilities Act. This goes beyond installing ADA-compliant curb ramps where they are still missing (appreciated by those pushing strollers and others) to making family events in our parks accessible to all generations. Accessibility issues for people with disabilities are also issues for pedestrians and vice versa. The ADA requires “accessible routes” between government facilities, including parks, and transportation and commercial centers. That includes a sidewalk on North Post Road between the Municipal Complex and the train station and a sidewalk between the Ron Rogers Arboretum and businesses on Route 571–two things the WWBPA wants to see happen and which will help make West Windsor a more pedestrian-friendly community. Beyond West Windsor … the missing link on the D&R Canal towpath is no more. An Aug. 14 bicycle ride co-sponsored by the WWBPA commemorated the completion of the 1.5 missing miles in Trenton, which now makes it easier to ride to the Delaware River and back. Be Visible As the days get shorter, the WWBPA reminds all bicyclists and pedestrians that it’s even more important to be visible to motorists. Need lights? Our $5 fall visibility special buys you a front and rear bicycle light. We also have $2 flashing lights to attach to backpacks and briefcases as well as $10 reflective vests. You can find us at the West Windsor Community Farmers’ Market on Oct. 2 and at Hightstown Harvest Fair on Oct. 9. Or drop us an email to arrange a sale. The WWBPA this year has two student advisors: Kim Meersma, a senior at WW-P High School South and in her third term, and Rachel Karp, a sophomore at WW-P High School North and a first-year advisor. As teenagers we often feel uninvolved and unimportant in helping to improve our community. Being a student advisor to the WWBPA has helped us to take an active role in West Windsor. We work to promote bicycle and pedestrian safety and encourage people to bike and walk more through a number of events which take place each year, including the Community Bike Ride. Student advisors also help staff the WWBPA table at the West Windsor Farmers’ Market as well as attend WWBPA Trustee meetings. We are planning to assist students at the local elementary schools in learning about bike safety and how to maintain their bikes. Additionally, we hope to organize an event at the high schools. If you are a West Windsor or Plainsboro high school student interested in becoming a student advisor or helping with an event, you can contact the student advisors at wwbikeped@gmail.com. In addition, the WWBPA will be seeking applications for new student advisors in December. Check wwbpa.org for updates and the application. Upcoming eventsOct. 2: Fourth Annual Community Bike Ride, 2 p.m. Chamberlin Park, Slayback Drive. Oct. 6: Walk to School Day. 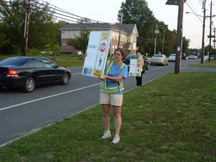 West Windsor Walks, 7:15 a.m. to 7:45 a.m. by the crosswalk at ClarksvilleRoad and Norchester Drive, near WW-P High choolSouth,o draw attention to the new pedestrian crosswalk law. Also, Walk to Hawk, 8 a.m., a walk from West Windsor Municipal Center to Maurice Hawk Elementary School. Oct. 9: Hightstown Harvest Fair, 10 a.m. to 4 p.m. in downtown Hightstown. Oct. 21: West Windor Walks, 5:30 p.m. to 6 p.m., to draw attention to the new pedestrian crosswalk law, by the crosswalk to MarketFair at Canal Pointe Boulevard and Mayfair Drive. Nov. 6: West Windsor Walks, 6:45 am. to 7:15 a.m., to draw attention to the new pedestrian crosswalk law, by the crosswalk at Cranbury/Wallace Roads and Route 571. What’s your suggestion for a bicycle or pedestrian safety event? The WWBPA would like to expand Walk to Hawk to another school. Drop us an email with your thoughts and talk to your children’s principals about ways to encourage safe routes to school. You’re missing a lot of news if you wait for the newsletter. Keep up with WWBPA activities and learn about other bicycle and pedestrian topics by subscribing to our website, wwbpa.org. It is generally updated several times a week. We’re also on Facebook. The two sites have similar — but not identical — information. Leave us your comments! Follow us on the Web at wwbpa.org, on Facebook and on Twitter. Or email us at wwbikeped@gmail.com. Keep our newsletter out of your spam box; add our email to your address book.